It’s Complicated… – Conflict Research Group, Intl. 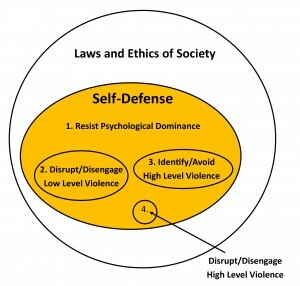 What is Your View of Self-Defense? Self-defense is having to fight off someone who attacks you. Martial Arts & “Realistic” Combatives teaches students how to fight. 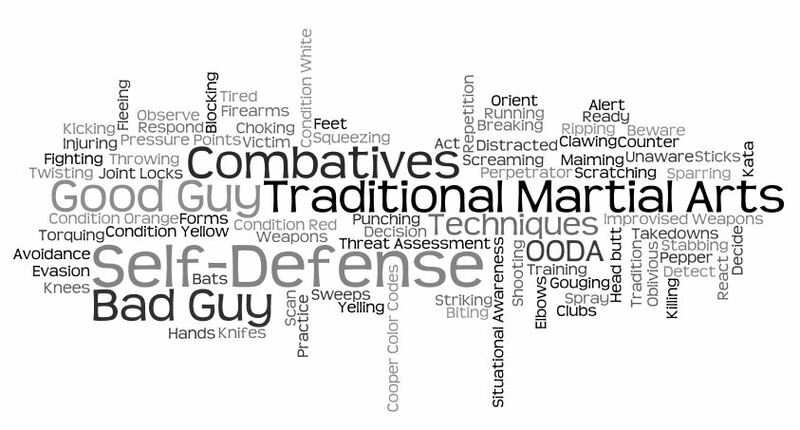 Thus, Self-Defense instruction is Martial Arts & “Realistic” Combatives training. And you should also use situational awareness to avoid fighting as much as possible. 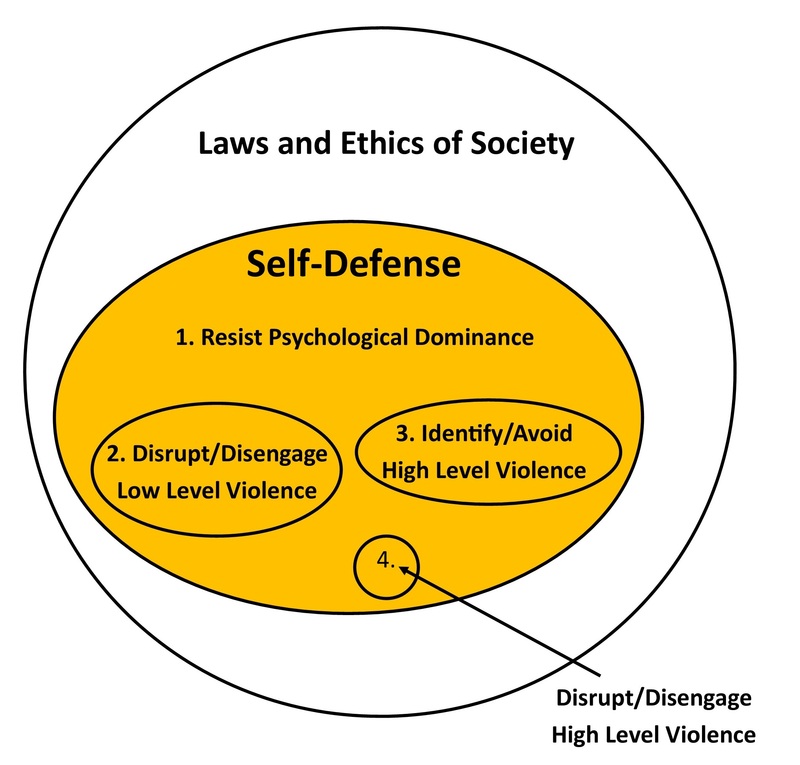 Violence and Self-Defense are complicated. How come? Self-defense is about people minimizing the chances and consequences of being victimized by predators. Therefore, self-defense instruction is requires focusing on the individual student’s needs and likely problems faced, while taking into consideration the student’s physical, emotional and mental abilities and limitations. Most people who are the likely victims of predators are out matched physically, emotionally, and mentally in terms of the use of violence. Therefore, the majority of self-defense instruction should consist of teaching people how to avoid violence by not being targeted in the first place, as opposed to teaching them how to fight. Given their inherent disadvantages, the most likely prey are also likely to lose a fight with a predator. Self-defense is not about fighting because predators don’t want to fight. Predators don’t want to fight because fighting is mutual combat. Mutual combat is risky for all parties engaged. Predators want to avoid the risk of both injury and incarceration for their actions. Instead of fighting, predators usually either use psychological dominance or overwhelming violence to achieve their goals. 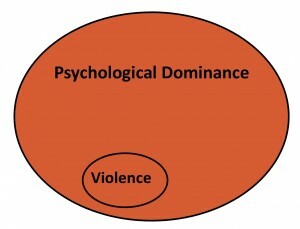 Psychological dominance is the preferred and least risky method. The lack of physical violence makes an intensive police investigation less likely, it leaves no physical evidence, and victims are less likely to report the violation. When violence is used, the least risky method for the predator is to use asymmetrical tactics such as an ambush, utilize a weapon, or have superior numbers, size and strength. Therefore, learning to fight is not an effective means of self-defense. 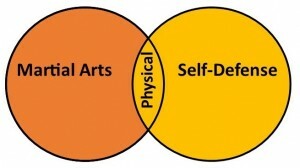 Thus, typical Martial Arts training is also not an effective means of primary self-defense instruction. 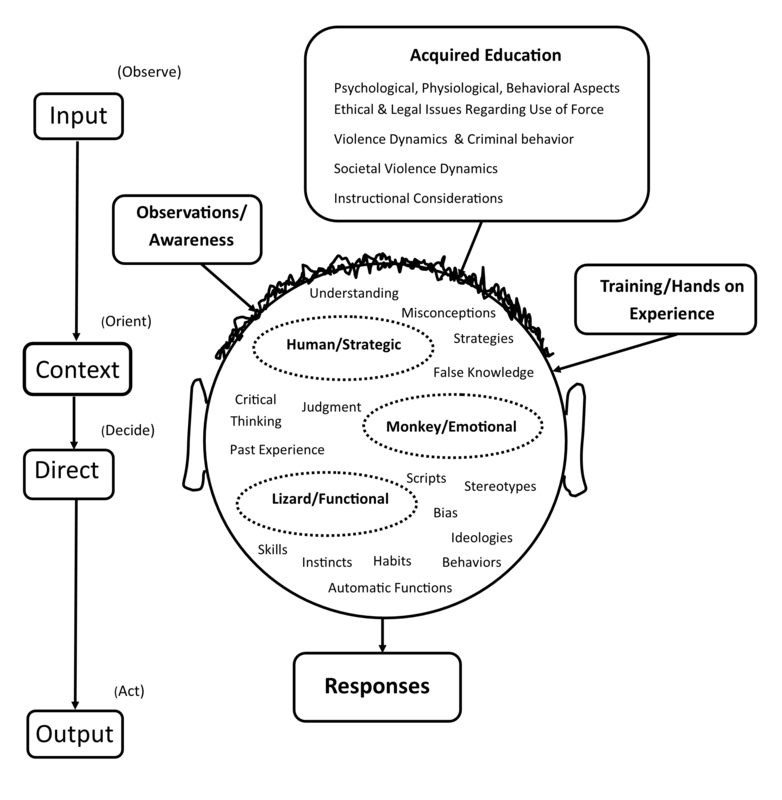 The largest student gains from self-defense instruction comes from teaching people how to avoid being targeted by predators through identifying and understanding how predators and criminals operate and then using good judgment and critical thinking to apply avoidance/deterrent strategies and tactics, and knowing the difference between imagined fear and real danger. 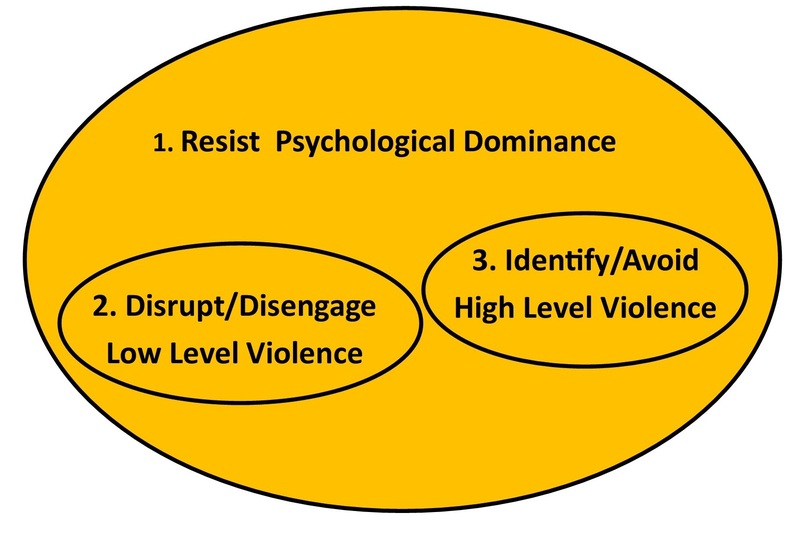 In the event avoidance/deterrence doesn’t work, students need to understand how to resist psychological dominance and use physical defense responses to escape. Students need to learn to avoid the spiral of Deny, Delay, and Do nothing. Most of what people think of as “fighting back” is actually resisting a combination of psychological dominance and low level violence from low motivated predators. Highly motivated predators need to be avoided/deterred. Physical defense from a highly motivated predator requires a physical, emotional, and mental skill set beyond the capability of most people. Contrary to popular belief many incidents of violence in society are inherently social in nature as opposed to asocial/predatory. Self-defense involves Prevention, Intervention, and Mitigation of unwanted aggression. 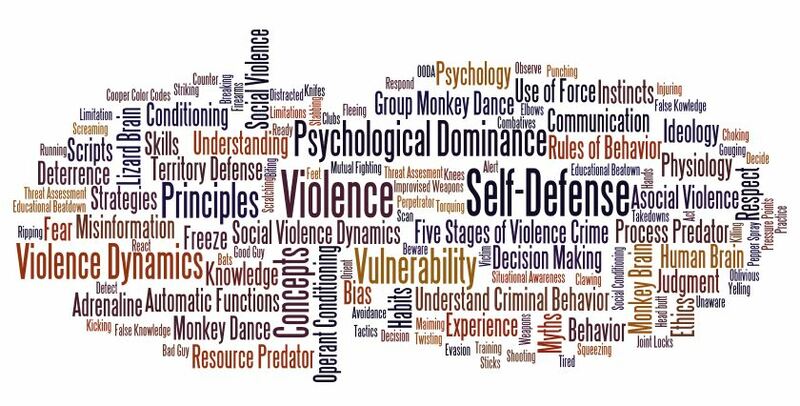 Not only is self-defense about people minimizing the chances and consequences of being victimized by the common lower level violence predators, it also includes dealing with the less frequent but highly violent predators that cannot be avoided or deterred. AND all of the responses must be done within the confines and restrictions of the laws of society. Going to jail, being sued, or spending thousands of dollars on legal fees is a negative consequence that needs be taken into consideration. Here are two problems with taking your training out into the streets. 1) It doesn’t work. 2) It does work. In violence professions there’s a period of accompaniment by field training officers to help the newbie. 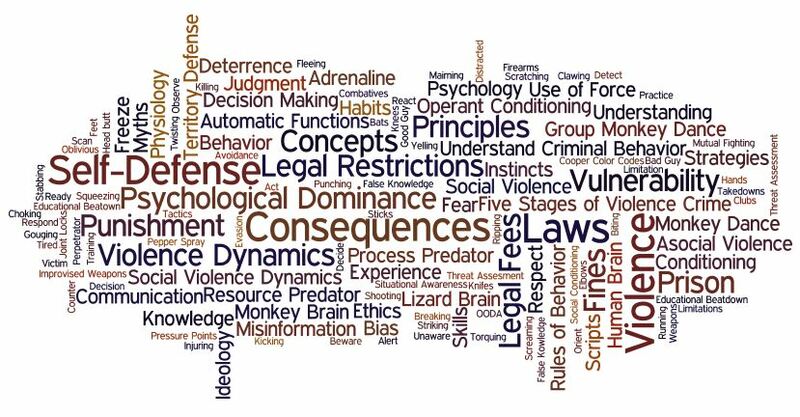 Individuals experienced with functioning within the variables, realities and limitations of live fire situations. This combination of supervision and experience helps make the transition from the safety of school to application. No such safety net exists for self-defense training. Another manifestation of works/doesn’t work is how many people self-select the scope of their training. 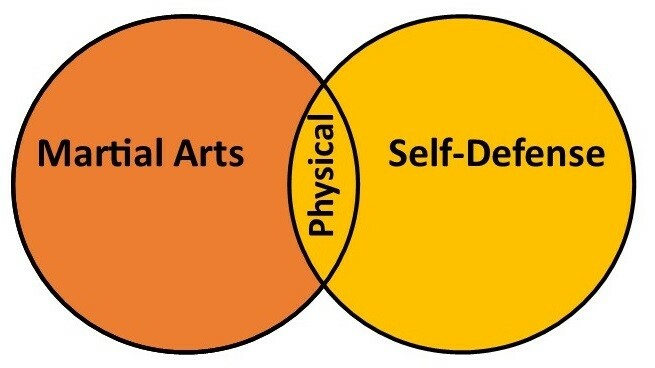 Take for example someone who only focuses on learning physical techniques or a ‘fighting system’ without expanding their training to include threat assessment, scaling force and the meaning and interpretation of self-defense laws. This is how people end up going to prison ‘for defending themselves.’ Had they learned this additional information they’d have known what they did wasn’t self-defense, but the illegal violence they were convicted of. We of the CRGI group can’t be there with you when something happens, What we can do is provide you with the experience of field training officers to help you from making the rookie mistakes that will get you killed, or sent to prison for having to use your self-defense training or because you couldn’t explain your actions clearly in court. Method #1. Conscious teaching through the use of seminars, talking, discussion, etc. This type of teaching goes to the thinking Human brain. It is effective for high level learning such as planning, making connections between concepts, principles, and experiences, and for passing along information to be stored and processed. The problem is that under stress, the Human brain shuts down. And even when not under stress the Human brain processes too slowly for the necessary physical movements for dealing with violence. Therefore, the Human brain is best utilized for the judgment and critical thinking aspects of avoidance and deterrence of predators. Method #2. Physical training through practice, drills and repetition. This type of instruction is the staple of most martial arts. The problem is that due to the stress of violent confrontations, instinct overrides training in the first few incidents. Therefore, this training has little value for the average person who needs an effective response the first and every time. The typical civilian that is involved in many violent incidents needs to re-evaluate and change his or her behavior and lifestyle. Therefore, this type of training is most useful for professionals that expect to be involved in many incidents and can afford the risk of being ineffective for the initial incidents. Effective training becomes a important factor after multiple incidents, maybe 5-20 or so. Method #3. Conditioning via Stimulus-Response-Reward and Stimulus-Response-Punishment. Conditioning goes directly to the Lizard (hind/primitive) brain. Therefore, it skips the slow processing of the Human brain. Conditioning also overrides training. Conditioning also creates an artificial reflex. The problem with conditioning is that not all movement can be conditioned. It only works on simple responses. For example, you can’t be conditioned to ride a bike. Conditioning also occurs as an unintended consequence of training. Some types of Martial Arts training systemically creates unwanted conditioning. For example, training to hit, but conditioning to miss, and/or training to win, but conditioning to lose. 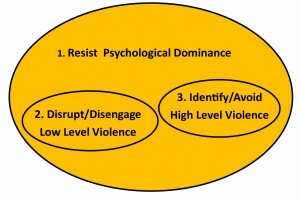 Due to the rapid ingraining of conditioning it is effective method for teaching people how to respond and resist psychological dominance combined with low level violence from predators. Therefore, instructional conditioning provides big gains, but tops out at a low level of skill. Method #4. Play for learning is an effective method and is used in nature. Play goes to the Lizard brain. It is based on fun and natural movement. Play makes hitting and being hit fun and ingrained. Play skips the Human brain which process too slowly. It skips the Monkey brain which can’t handle the stress of violent confrontations. Scenario training is complex play. It provides the opportunity to bring in the judgment and critical thinking of the Human brain and tie multiple concepts together. Play also incorporates conditioning under stress. Stress makes people assume what they are experiencing is “real”. Therefore, stressful scenarios have the potential to lock in both good and bad responses long term. Thus, scenarios must be used carefully.